The issues and concerns of operators of towing companies, rather than marine attorneys or insurance brokers, were highlighted more than usual at the 36th annual River and Marine Industry Seminar, presented by the Greater New Orleans Barge Fleeting Association (GNOBFA) at its traditional location, the Intercontinental Hotel in downtown New Orleans, April 24–27. “Past seminars were heavy on legal and insurance matters; this year, we are trying to focus more on operators and to get the right blend,” said Marc Hebert, the seminar’s co-moderator and a senior partner with Jones Walker. Part of the reason for this focus is this year’s upcoming full implementation of Subchapter M on July 20. Within a year of this date, 25 percent of a company’s towing fleet must obtain certificates of inspection (COIs) demonstrating compliance with all of Subchapter M’s requirements. This is the first year of a staggered several-years-long process at the end of which all towing vessels will be certificated. 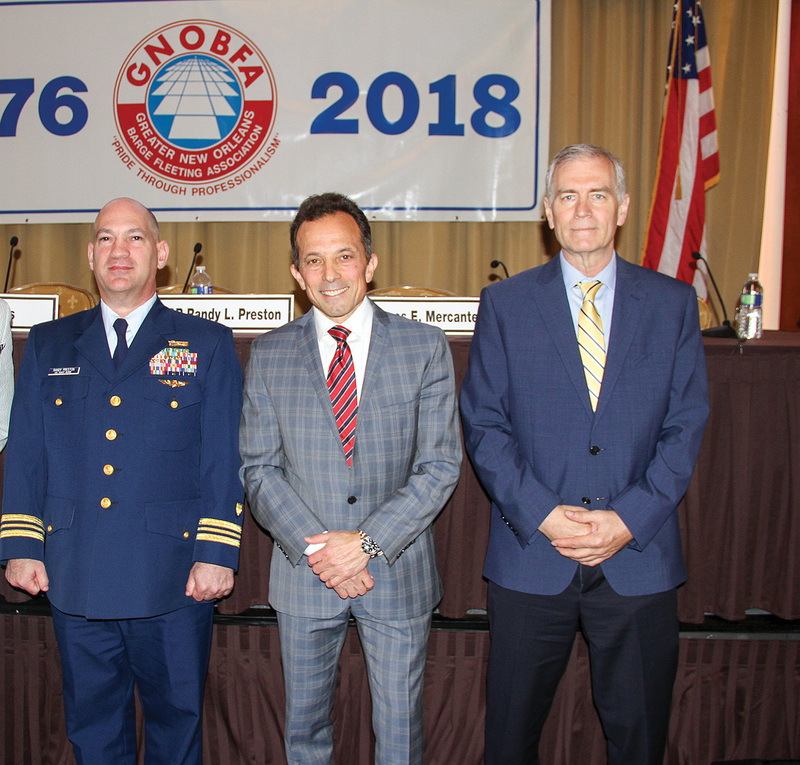 That focus on the marine operator didn’t mean there weren’t also plenty of maritime attorneys, safety managers and insurance brokers in the audience of more than 400, including many first-time attendees. Gonzales wryly noted that Sub M itself might be the reason why there were not more operators present at this year’s seminar. “They are vigorously working on Sub M compliance and getting their COIs,” he said. All transportation systems face the same challenge today, said Thomas: to build capacity and increase throughput while reducing environmental impacts. Marine transportation systems, he said, are best positioned to meet that challenge. Thomas stressed that any talk about infrastructure must include information infrastructure. “The so-called ‘internet of things’ is part of the necessary technology to meet these challenges, but it brings with it new vulnerabilities,” he said. Cyber is not a “brave new world,” just another set of tools that come with operational risks, as with physical systems. The difference is that cyber tools, unlike other systems, can put the entire maritime system at risk. The challenges fall into three broad areas of responsibility, Thomas said. The industry has to identify where a cyber system poses the most risk. It must identify procedures for maintaining cyber systems, and it must identify training and procedures for the people operating them. Thomas noted that “at least in the near term, we are in a de-regulatory environment.” Regulations, he said, are always slow, reactive and expensive. A study has estimated that 80 percent of the regulatory burden on the maritime industry comes from just two laws: the Oil Pollution Act of 1990 and the Maritime Transportation Security Act of 2002. “Regulations can set the bottom, but not the bar,” said Thomas. He championed what he calls “full-spectrum governance” by the maritime community. “All stakeholders must use every tool to influence the behavior of all other actors,” he said. • the system must have transparency. This third point “is where I hear most resistance from the maritime industry,” said Thomas. Thomas said waterways action plans in ports serve as a good example of shared governance because “these are put in place by stakeholders, not the government.” Seminars like those given by GNOBFA help build shared governance. 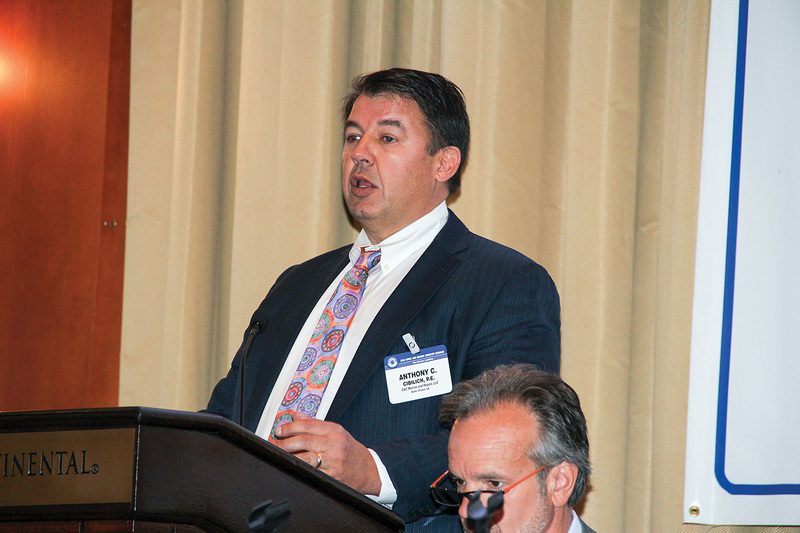 Thomas said this approach is guiding his policy letters on Subchapter M. He noted that the industry has lost six towing vessels and five lives in the past few months from situations that Subchapter M was designed to address. 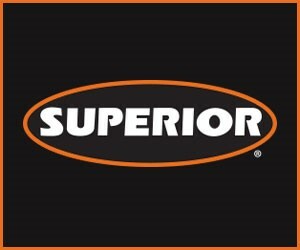 “Your risk will not suddenly become greater the day after July 20. Subchapter M is not an emergency regulation,” he said. Lee Nelson, president of Upper River Services and a frequent member of industry committees, also questioned inconsistencies he said he was getting from OCMIs on such issues as through-hull fittings and keel coolers. The second session, on “Developments in the Marine and Marine Insurance Fields,” was given by Gary Haugen, a Seattle maritime attorney from the firm of Bauer Moynihan & Johnson LLP. Haugen opened with a “cautionary tale from the regulatory front,” the case of the fishing boat America’s Finest. America’s Finest is an advanced, 264-foot, $75 million fishing trawler built by Dakota Creek Industries, based in Anacortes, Wash. According to a website the shipbuilder created when the boat ran into regulatory difficulties, the vessel, with the latest emissions technology and crew comforts, was Washington’s largest private shipbuilding investment in the past 12 years. When completed, the boat is estimated to be able to produce between $50 and $70 million a year in revenue. However, the shipyard made a big mistake when it used specially formed Dutch steel for up to 10 percent of the hull by weight. The Jones Act allows no more than 1.5 percent of the hull’s weight to be from foreign-sourced materials. “When Dakota Creek started this project, they were unaware of private rulings by the U.S. Coast Guard regulating the use of foreign steel in U.S.-built fishing vessels,” the website states. By the time the company was made aware, the vessel was 85 percent complete. The U.S. Coast Guard’s National Vessel Documentation Center declined to issue a waiver last August. An effort to get a waiver introduced in Congress by the area’s representatives reportedly fell victim to jealousy from rival fishing companies, who were afraid of being out-competed by the advanced vessel. They demanded that any rescue bill include provisions limiting its catch. The bill was reported out of the Senate but failed to be included in the omnibus spending bill. Barred from operating in U.S. waters, the vessel will now have to be sold to a foreign buyer by its customer, Fishermen’s Finest Inc., and the shipyard that built it faces bankruptcy—because, as Haugen noted, contractual liability (i.e., overlooking Jones Act requirements) is usually not covered by builder’s insurance. Other regulatory news presented by Haugen came from cases in the 2nd, 5th and 9th Federal Circuits. A complex case is that of OW Bunkers, which has “seemingly involv[ed] most of the admiralty firms in the country,” said Haugen. That’s because a long line of creditors must be sorted out to see who gets priority under maritime law, which gives rights to chains of creditors many layers deep. This case has featured interparty actions, under which a creditor can pay owed money to a court in a trust, while the court figures out who ultimately gets it. In Krekorian v. FMC Technologies Inc., argued in the 5th Circuit, a Jones Act personal injury plaintiff demanded all written or videotaped evidence concerning him prior to his giving a deposition. The court agreed with the defendant that the plaintiff was entitled to them only before trial, not necessarily before deposition, due to their impeachment value. In Halle v. Galliano Marine Service LLC, the 5th Circuit denied that a technician operating a vessel-based remote-operated-vessel was a seaman under the Fair Labor Standards Act. His work in providing coordinates to the vessel’s master did not make up 80 percent of his work week. The 9th Circuit ruled (in Coastal Villages Pollock LLC v. Ahokaya v. Lanu Naufahu) that an employee who concealed pertinent facts about a prior medical condition before his hiring is not entitled to maintenance and cure. Other cases discussed by Haugen involved two perennially contested matters: which contracts fall under maritime law and the limits of admiralty tort jurisdiction. The next panel included naval architect Ed Shearer, principal of The Shearer Group of Houston, Texas; Capt. 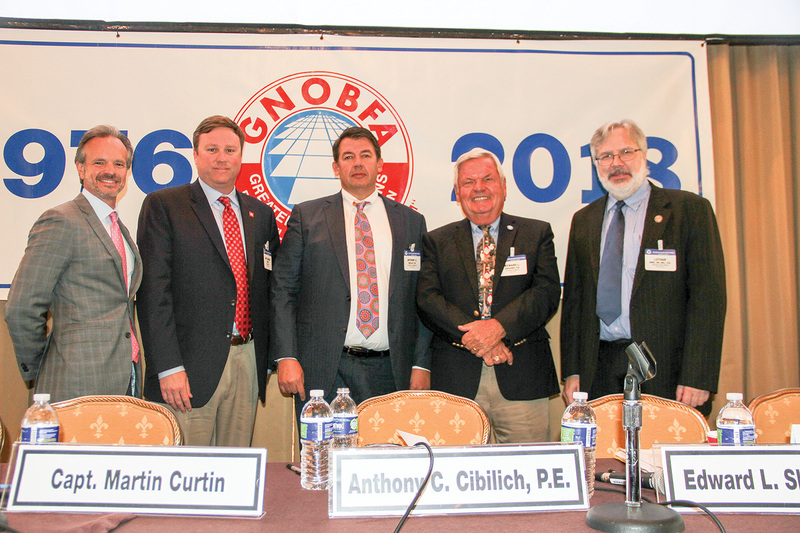 Martin Curtin of Curtin Maritime, Long Beach, Calif; Anthony Cibilich of C&C Marine & Repair, Belle Chasse, La. ; and Lothar Birk of the University of New Orleans’ School of Naval Architecture. Shearer spoke on “The Past, Present and Future of Towboat Design.” He began by noting that towboat design has not substantially changed since the 1930s except in the areas of machinery, electronics and crew comforts. Shearer then discussed azimuthing stern drives, or Z-drives, which his firm has led the way in reintroducing to the rivers, beginning in 2007 with vessels it designed for Southern Towing. Since the pioneering Frank T. Stegbauer was built, said Shearer, more than 80 Z-drive towboats have been built for the rivers. He called the Z-drive hull the “design of the future” for towboats. Thanks to that software, yards can now create and conduct virtual walk-throughs in a computer simulation, checking to make sure very component fits with every other, before building anything. The software means that each vessel is like a jigsaw puzzle, with every piece numbered. All that precision makes covered yards a necessity. “Since inclement weather, and the scheduling delay it imposes, is no longer a major concern with covered fabrication, the efficiency at which vessels are constructed is improved,” he said. His company has 450,000 square feet under one roof. To deal with the environmental consequences of sandblasting and painting, C&C has two buildings devoted exclusively to blasting and painting. They use state-of-the-art ventilation and filtration systems. The design is these buildings is patent-pending. The buildings also use small-scale blasting cabinets, within which parts can be blasted and all material recovered. Instead of sand, C&C uses steel grit that can be reused up to 150 times. “We ‘stole’ blasting techniques from the railcar industry,” he joked. Manual blasting systems used to blast 100 square feet per hour, vs. the 6,000 possible with robotic systems. Modular construction also speeds building time. It is aided by C&C’s four transporters, with payloads varying from 300 to 420 tons, to move completed modules around the yard. Lothar Birk, who holds the Huntington Ingalls Inc. Endowed Professorship in Naval Architecture and Marine Engineering at the University of New Orleans, briefly discussed the history of the program. Funded by the shipbuilding industry, it began in 1980 and graduated its first student in 1984. Currently enrolling 130 undergraduates and 20 graduate students, it is one of only three such programs nationwide, and supplies most naval architects and marine engineers in the Gulf. In the U.S., said Birk, investment in advanced infrastructure in the marine sphere is way behind that of some other nations like Norway. China and India together are educating about 1 million engineers a year, compared to 190,000 a year in the U.S. And they are greatly needed; there is more computer power on a container vessel than on a space shuttle, he said, although public perception has not yet caught up with marine technology advances. Birk said 3-D printing is coming into its own and noted the recent first 3-D printing of a class-approved marine propeller. It’s entirely possible that 3-D printers could one day print objects like marine pumps. Birk said he believes electric propulsion, fueled by solar cells or hydrogen cells, will eventually replace internal combustion engines on the rivers. Even some recently developed paints and coatings, he said, can be used as solar cells. Autonomous vessels are another area in which innovation is happening, though mostly overseas. Europe already has autonomous ferries and passenger vessels under development. During the floor discussion, Curtin warned operators to be wary of some touchscreen products, which he said might not necessarily be designed for the environment aboard a towboat. “Vibration and electronics don’t like each other!” he said. The next panel, on “robotic seamen,” was composed of doctors and surgeons and dealt with shoulder, knee and back surgery. Scott Tucker, an orthopedic sports surgeon, discussed shoulder surgery in detail, while Richard Meyer covered the hip and knee and Najeeb Thomas the spine. Physical therapist Morell “Mo” Crane discussed physical therapy and rehabilitation. Among the points discussed: expensive CT scans are rarely necessary to diagnose most joint complaints, which show up fine on ordinary X-rays. Meyer said he rarely recommends heat and electrical stimulation, finding more value in stretching and controlled exercise. For hip injuries, he has pioneered a particular surgical approach that involves an anterior approach to minimize muscle damage, shorten hospital stays and provide greater stability. His approach allows a faster return to work than other approaches and has since been adopted by many clinics, he said. With this procedure, most patients can walk from day one. Insurers in the audience asked many questions about when the various surgical procedures are or are not indicated, and what the outcomes are for both return to work and transition to lighter work. Thursdays at GNOBFA are often devoted to the investigation of marine casualties or incidents. 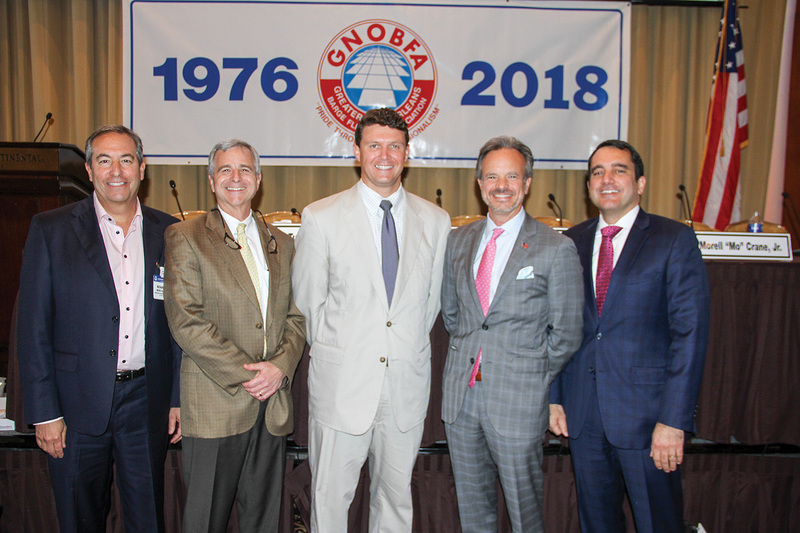 Hebert noted that the first April 26 session included a landmark: Brian Curtis, director of the Office of Marine Safety at the National Transportation Safety Board (NTSB), spoke, the first time anyone from NTSB had addressed GNOBFA. Besides Hebert, the other panelists included Lt. Cmdr. 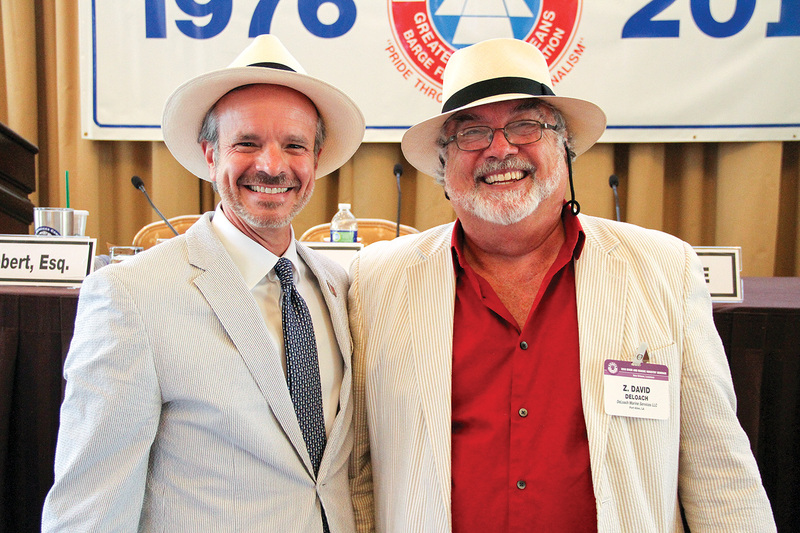 Randy Preston of the Coast Guard’s Investigations National Center of Expertise in New Orleans; and maritime plaintiff’s attorney James Mercante of New York law firm Rubin, Fiorella & Freedman, a King’s Point graduate who has served as president of the New York Pilot Commission. Congress established the NTSB in 1967, said Curtis, and at first located it within the Department of Transportation, but it was made an independent agency in 1974. Today it has a budget of about $105 million and employs 400 people. Its board is made up of five members appointed by the president and confirmed by the Senate for five-year terms. The NTSB has five offices responsible for investigating incidents in marine, aviation, highways, rail and pipeline and hazmat facilities. Its marine staff include 12 investigators, including four Coast Guard-licensed chief engineers, four licensed unlimited masters, three experts in survival factors and emergency response, and one in human performance. The NTSB investigates “major” marine casualties, defined as one involving more than $500,000 in damages, six or more fatalities, or the loss of a mechanically-propelled vessel over 100 gross tons. After reviewing the rules under which various persons, companies or groups can be considered “parties” to an investigation, Curtis noted that in marine investigations in which the NTSB takes a hand, it often partners with the Coast Guard—up to a point. The Coast Guard participates according to terms set out in a memorandum of understanding between the two agencies. In a joint investigation, one agency will be the lead. The NTSB and Coast Guard may cooperate and share resources during the fact-gathering stages of a marine investigation. Mercante said that any time the two agencies are talking about who should take the lead, “it’s a major marine casualty and you [operators] should have attorneys who specialize in this!” The company is still entitled to conduct its own investigation, independently of what the agencies do. During a joint investigation, both agencies are supposed to be equal partners and share evidence. Coast Guard vessels can carry NTSB investigators to a vessel, and Coast Guard personnel can use NTSB laboratories. They may also work together on technical reviews. After the fact-gathering phase, the two agencies separate into their “corners,” each making their own independent analyses from the same set of facts and drawing their own, independent conclusions about probable cause and other matters. Curtis noted that as an independent agency, the NTSB automatically investigates any major incident in which the Coast Guard itself is involved. A “public/non-public” incident merits investigation if it exceeds $75,000 in damages and one or more fatalities (i.e., if a Coast Guard vessel causes damage to a private vessel or dock, for example). The NTSB may also refer any criminal conduct it uncovers to the FBI. He noted that the dollar thresholds for marine casualties are widely recognized as outdated, since they are not inflation-indexed, but it is Congress who must change them. NTSB final reports are not admissible in court—but field investigators’ reports may be. But companies can still use NTSB reports to guide their defense, even if they cannot cite them directly. Coast Guard officers and investigators can be deposed, but “it’s not easy,” said Mercante. Curtis said the NTSB investigates between 12 and 20 marine casualties a year, out of a range of anywhere between 2,000 to 10,000 incidents. A presentation on cybersecurity was given by a panel including Capt. 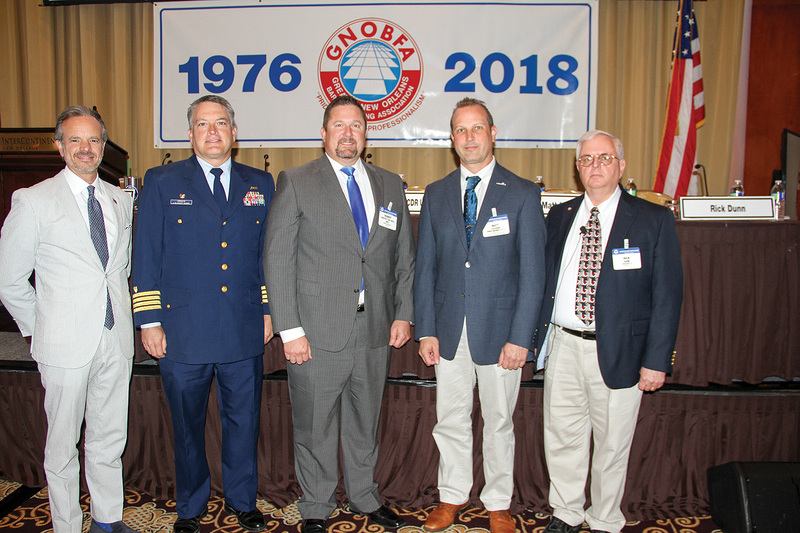 Ryan Manning, chief of the Coast Guard’s Office of Port and Facilities Compliance; Robert Guidry, a consultant with Global Data Systems Inc. of Lafayette, La., and Andrew Lee of Jones Walker. In his introduction, Hebert remarked that even though the Coast Guard is still developing regulations for cybersecurity, it’s wise for operators to include it in their safety management systems. Manning said any organization must develop a cybersecurity strategy in three phases. Phase 1 will involve awareness and training of all personnel; phase 2 will develop structures of industry-led governance; and phase 3 will put in place best standards and practices as the Coast Guard coordinates international standards put forth by groups like the International Maritime Organization (IMO) and the work of class societies and equipment makers. In June 2017, the IMO published a resolution titled “Maritime Cyber Risk Management in Safety Management Systems” that called for all cybersecurity measures to be integrated into all maritime safety management systems by January 2021. The Coast Guard, working with industry and the National Institute of Standards and Technology, will develop a path to implementation. Guidry noted that 85 percent of malicious attacks continue to come through email and could be prevented by simple security protocols. Lee noted that shipping companies are increasingly reporting ransomware attacks, in which hackers seize control of a victim’s systems and release it only after a ransom is paid. By 2016, he said, ransomware was a $1 billion industry. Lee and other speakers referred to the disastrous hacking suffered by Maersk, the Danish global shipping giant, last year. Maersk, which has offices in 130 countries and a workforce of close to 90,000, fell victim to a version of the so-called Petya ransomware called NonPetya that caused it losses of up to $300 million. At the World Economic Forum, A.P. Møller-Maersk chair Jim Hagemann Snabe described having to reinstall 4,000 new servers, 45,000 new PCs, and 2,500 applications over a 10-day period. Maritime systems like AIS that depend on GPS satellites are vulnerable to “spoofing” and “ghosting,” in which false positions are deliberately planted on radar equipment by hackers. “The omnipresence of AIS, combined with its complete lack of security features, is a recipe for security breaches,” said Lee. AIS “spoofing” is also used by vessels carrying illegal cargo to fool watchers; this is how Iran and North Korea attempt to move contraband cargo by sea. It was due to the awareness of such risks that the U.S. Navy returned to training cadets in celestial navigation using the marine sextant in 2016, ten years after it discontinued the practice. 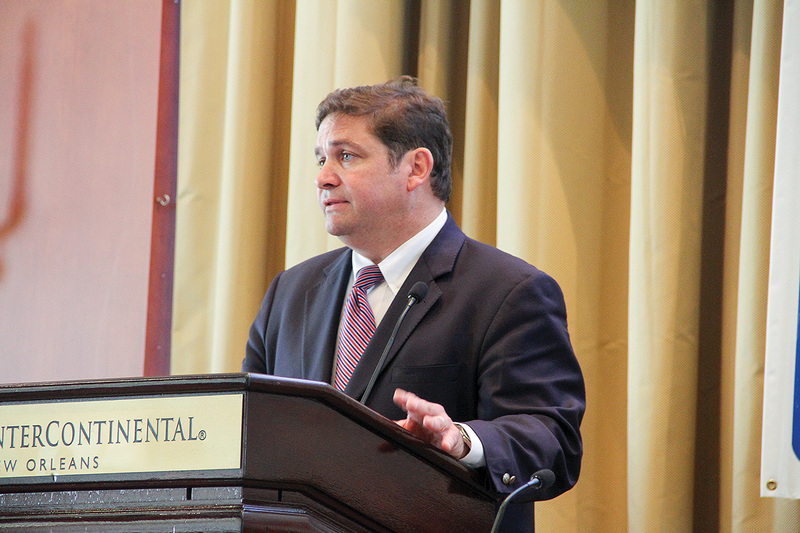 Jim Adams, of Jones Walker’s Washington, D.C., office, and Geoffrey Green—who recently moved from the office of Sen. John Kennedy to become the legislative director for Rep. Steven Scalise—gave a lively Washington update. In a whirlwind tour of President Trump’s activities to date, Adams noted that in 2017, federal agencies issued 22 deregulatory actions for every new regulatory action and have reportedly achieved $570 million a year in regulatory cost savings. The goal for 2018 is to cut more than $9.8 billion in lifetime costs of regulations. Adams discussed the recent failure of the Vessel Incidental Discharge Act (VIDA) in Congress. A top legislative priority of the barge industry, VIDA would replace a patchwork of different state discharge standards with a single federal standard. After its supporters believed they had secured bipartisan agreement, it was dropped from the spending bill after eight senators flipped their votes, all Democrats except for independent Sen. Angus King of Maine. Some of those who switched their votes had actually sponsored earlier versions of VIDA. Various theories about why this happened run from the concerns of Great Lakes senators about ballast water to orders from Senate minority leader Chuck Schumer wanting to “burn up the clock” to frustrate Trump’s agenda in Congress. VIDA’s supporters vow to reintroduce it again quickly. Among the priorities of Waterways Council Inc. for 2018, said Adams, a proposal is being floated to put 10 percent of fees from federal hydroelectric plants into the Inland Waterways Trust Fund, which would add $1.5 billion. In the House, all 435 districts are up for election this November, and 51 members are retiring. Of those seats, 19 are considered toss-ups, 21 lean Republican and nine lean Democrat. To regain a majority in the House, Democrats need to add 24 seats. In the Senate, three Republicans are retiring. Democrats are defending 24 seats, while Republicans defend eight. Five seats are considered toss-ups; Democrats need only two seats to regain the majority there. Frank Morton, founder and president of Turn Services, asked whether the speakers saw more partisanship in the House or Senate. Greene gave an indirect answer, answering that supermajorities tend to breed factionalism within the majority party. For an example, he offered his state of Kentucky, which has its first supermajority among elected officeholders of Republicans since Reconstruction, but with major infighting among different factions. He noted that the vetoes of all eight bills vetoed by the Republican governor were overridden by the Republican-majority legislature. The last day saw one of the most important panels, “Managing Liability and Insuring Risk in the World of Subchapter M.” Speakers included Hebert; Robert Keister, manager-compliance and special projects at ‎Sabine Surveyors Ltd. and a retired Coast Guard veteran; Rick Dunn, a marine safety consultant, president and founder of SafeMARINER and a veteran panelist at GNOBFA; Matt Lagarde, who has recently taken a position as manager of tank barge regulatory programs at Ingram Barge Company; and Capt. 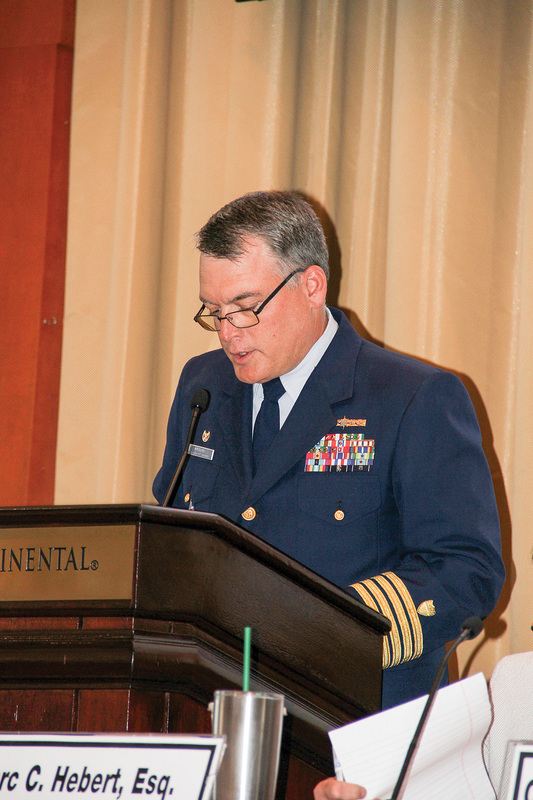 Wayne Arguin, outgoing Captain of the Port of New Orleans, who is leaving for a job at Coast Guard headquarters in Washington, D.C.
Arguin also spoke about the appeals process. “If you have a different interpretation of a regulation and exercise the appeals process, you should not fear retribution,” he said. “Open communications are the key” to successful Subchapter M implementation—for both the Coast Guard and industry. Arguin said District 8 teams have bi-weekly meetings with various Subchapter M constituencies. Keister laid out the steps involved in using a third-party organization (TPO) to comply with Subchapter M. To comply with ISO 9000 standards, there is a lengthy approval process for TPOs. Operators using a TPO for audits, he said, should sign a Master Services Agreement (MSA) with their providers, setting out exact expectations and requirements. The TPO will review the company’s towing safety management system (TSMS) and make recommendations about any gaps. The TPO and the company will close those gaps together. A company has to operate according to its TSMS for at least six months before it can be audited. The TPO assists the company in applying for a COI. Keister distinguished between the internal and external surveys. The regulations say surveyors have “oversight;” how they exercise it is up to the discretion of the TPOs, to some extent. After the survey is complete, the TPO performs an external vessel audit. One questioner asked what happens if there is a discrepancy between an internal auditor and the TPO. Keister said the first level of the appeal process happens within the TPO; the next resort is to the OCMI. Nonconformities other than those involving safety or firefighting can remain pending a final decision. Lagarde reminded everyone that Subchaptger M is not “coming” in July; “It’s been here for more than two years already!” According to Lagarde, the levels of actions and appeals run like this: Survey Audit > TPO Review > TPO Appeal (if dispute) > OCMI appeal > Captain of Port appeal > Coast Guard Headquarters appeal. Lagarde noted some ambiguities he called “Easter eggs” in the regulations. As of now, for instance, the entire Gulf Intracoastal Waterway is considered a “river route” under Subchapter M. He said there are implications missed by many in Subchapter M.
Companies need a written, documented process for both hiring and firing a TPO, for example. Installation of required equipment may not be enough if it is not periodically tested and the results documented. In some cases, the manufacturer’s test results may be enough, but it’s still better to test yourself, he said. Dunn began by reminding his audience that he was assigned to the Exxon Valdez a few months after the infamous 1989 oil spill. He said everyone will wind up getting a COI; “it’s just a question of how much pain you want to go through to get one.” Management must implant safety culture at all levels of the organization, a difficult process, he said. Some questions concerned regulations Occupational Safety and Health Administration regulations, whose role aboard vessels is formally superseded by Subchapter M in July, according to the Towing Vessel Center of Expertise. This issue is of interest to attorneys, since it could affect how certain injury cases proceed according to their date; one respondent said the issue will probably emerge in litigation. Dunn noted that there is some inherent tension between safety management as an engineering discipline and the Jones Act jury trial system. Keeping a log of “near misses” or nonconformities would be of great value for safety training, he said, but it is almost never done because such a log would be subject to discovery motions during a trial. The last panel was a “rapid-fire panel” or “lightning round” on topics including the accident report, the “sign-on/sign-off” sheet, the medical exam, the root cause analysis report, Coast Guard Form 2692 (the marine casualty report) and other issues involved in marine incidents that go to trial. The panel was introduced by Maurice Hebert, co-founder of the River and Marine Industry Seminar. Panelists included Thomas Kent Morrison of Phelps Dunbar in New Orleans; R. Keith Jarrett of Liskow & Lewis, also in New Orleans; and Christian Kelly, senior director of marine claims at Fidelis in Covington, La., who is also a maritime attorney who has practiced maritime law all over the world. The first issue involved the splits between various courts on the issue of whether punitive damages are available under the Jones Act, on which several important recent decisions have split (WJ, March 23). The Supreme Court will ultimately decide between the 5th Circuit’s and 9th Circuit’s interpretation of the issue. Jarrett pointed out that the role of the Supreme Court is to set judicial policy. A hypothetical situation brought into play the well-rehearsed topics of medical reports, punitive damages, maintenance and cure and the “sign-on/sign-off” sheet, which some companies ask employees to sign certifying as they leave the vessel that they have no complaints or injuries, nor did they witness any. Deloach said they are worthless, whereas Hebert said they can help a company defend a claim. Jarrett said he defended against a diver who claimed injury after attesting 26 times that he felt no symptoms—in other words, he violated Coast Guard regulations 26 times. The session became an open-ended discussion among the many claims adjusters, insurers and attorneys in the audience, leading several attendees to praise it as the best panel of the entire seminar. Morell "Mo" Crane, Dr. Richard Meyer, Dr. Scott Tucker, Marc Hebert and Dr. Najeeb Thomas.